Little boys with long hair can go beyond their stereotypes of short and clean-cut hair. With their cute little faces, it would be a pity not to pair it up with a stylishly styled long hair! 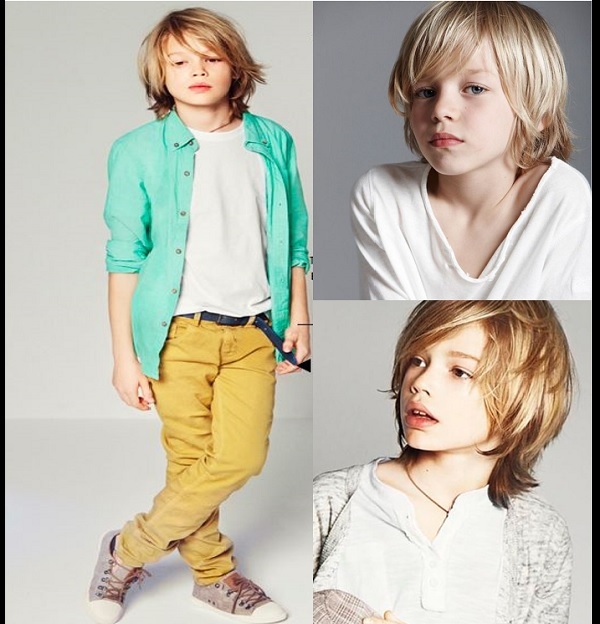 Long hairstyles for little boys can vary depending on their hair texture, length and natural styles. With their long locks and hair, it would be a pity not to take full advantage of the potential that they have right there! Young boys might have several different natural hairstyles that can be best suited with certain long hairstyles, so we have compiled a list of different long hairstyles for little boys below regardless of their natural hairstyles. Here, you can get inspired by hairstyles for long hair that you might want to keep them for your little boy next! Let’s take a look at all the hairstyles for little boys with long hair in our compilation below. Little boys with long curly hair are blessed in a way that they can just let their hair free! All they need is a few snips every once in a while to maintain a fluffy length and they are good to go. Curly hair with two colors rather than just one is beautiful too! If you want an elegant look for a young boy, this hairdo will do! Young boys will look smart and graceful with this natural long hair flow. It is also relatively simple to maintain – just a few snips every other month should do the trick! This is definitely one of the simpler long hairstyles for little boys that you can go for. Kids can have dreadlocks too! Dreadlocks will definitely take a lot of time to make at the beginning, but they sure can last after the work is done. Needless to say, this hairdo is much more suited for individuals with darker skin tones. However, do feel free to try this hairstyle out if you want to! Light blonde or a darker tone, you can leave your hair in a ‘long hair don’t care’ style! Long fringes can give a beautiful look to little boys. As long as the fringe is not too long that it obstructs their view, this hairdo will be just fine too! 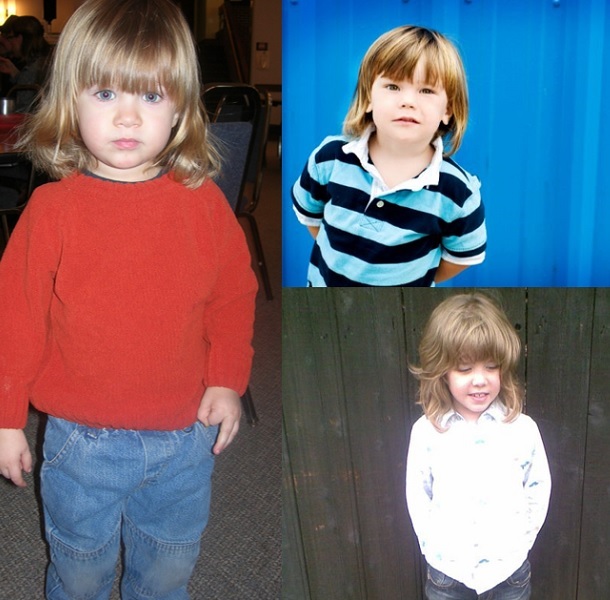 Little boys with long, wavy hair just look so adorable! This hairstyle for little boys with long hair look perfectly natural, and it could be a top choice among parents who do not want to impose gender stereotypes on their kids. Certainly, not your usual long hairstyle for little boys now, is it? Loved by lots of millennial parents, this long hairstyle for little boys are absolutely against any gender stereotypes. There are no rules for genders with this hairdo! You can let these boys wear their hair all pretty and dolled up if they prefer it that way. Why impose stereotypes? Bangs give little boys the youthful looks they deserve to have. Why cover up their faces when you can show off their cuteness? Bangs are the way to go if you want to have long haircut styles for boys which do not obscure their little faces. That fabulous fro hairstyle for little boys with long hair! You can be sure that everyone else seeing this is going to be so jealous. Wear your little boy’s hair up in a wild and carefree afro style if you want less effort or maintenance works! If you are going for an ‘I woke up like this’ look, this ‘fro style speaks it the loudest. Boys can still look boyish with long hair. More times than not, their facial structures will help to retain their boyishness. 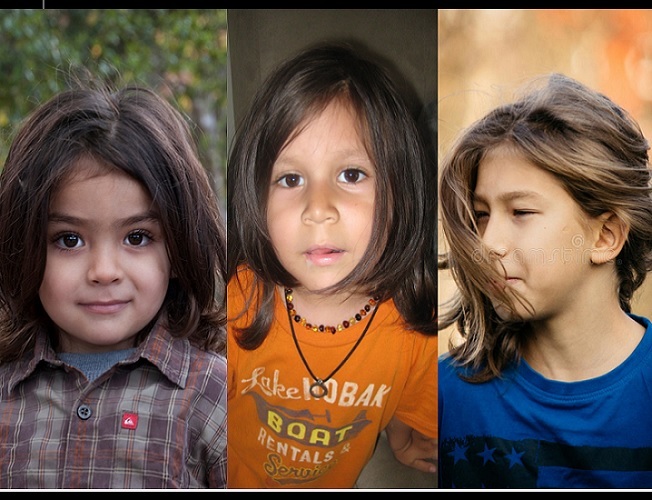 Even hair longer than shoulder length can still give these little boys a rugged look! The rest of your style is all up to the clothing choices now, so choose wisely! Straight long hair is too boring for you? Is curly hair too high to maintain? Have the best of both worlds with this long curled end hairdo! This adorable, sweet style is bound to steal hearts! You will usually see this long hairstyle on little boys and toddlers. 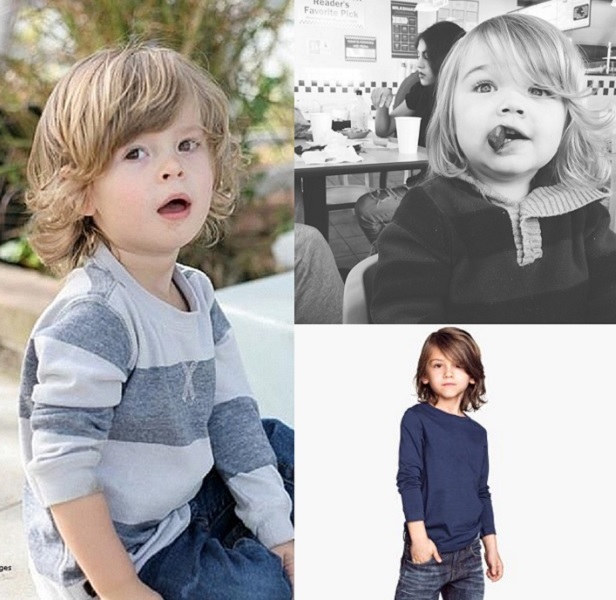 Long loose curls are simply magical – they can make little boys look super gorgeous. These loose curls can also give young boys a playful look when their locks drape over their faces. Simply adorable and irresistible, won’t you say? If you have naturally curly hair like this, you barely need to style it up! Just perform maintenance routines every once in a while. Maintenance measures are important to keep the locks from looking dry and messy, so be sure to keep it all up! Side partings work just as well on little boys and little girls. All you need to do is to sweep your hair towards one side and your job is practically done! The hair will flow along one side with no issues. It’s so natural and effortless that you don’t need any hairstyling skills! The thicker the hair, the better the effects for this hairdo. Not everyone can pull off a center parting with side bangs! However, children are blessed with their naturally cute looks. Little boys with long hair around the sides can use their side bangs to obscure their faces. If you have a very round face and want to create an illusion of a sharper look, you can try this. Side bangs can create that illusion for you! 15. Side Parting with a Bang! Little boys with long hair can rock this hairstyle as well as adult men do. You might see this style among famous celebrities! Members of boy bands in particular usually wear this hairstyle at some point. That sure says something about how stylish this hairdo is, doesn’t it? The thing about cornrows is that you can create the pattern of the flow. How do you want the cornrows to split your little boy’s long hair into different sections? You might remember seeing this hairdo on Jaden Smith, but of course, he is not the only celebrity to wear cornrows! This will definitely take a lot of effort and patience to build up though. Do you have what it takes to create patterned cornrows? This cornrow style features one cornrow braid in each uniformly divided section. To compare, the cornrow braids above feature a more streamlined look, while this one would create a more scattered appearance. Most of the time, the cornrow style for this hairstyle with long hair has smaller braids as well. If you want your little boy to have long hair that reflects how naughty and playful he is, this is the style to go for. 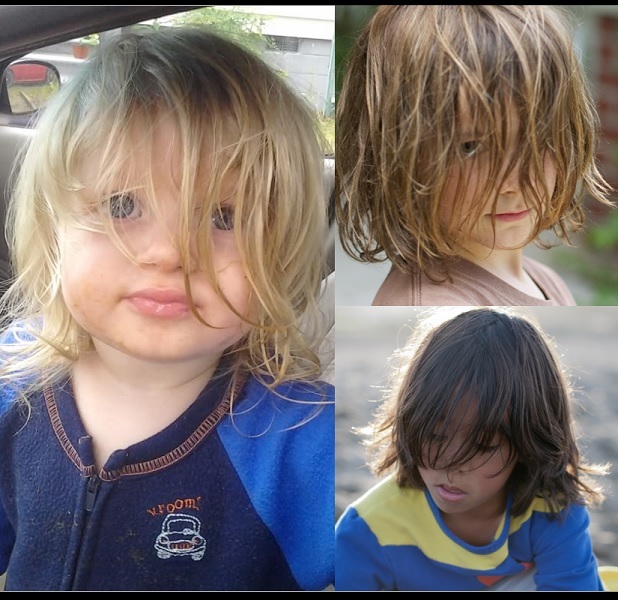 This long hairstyle for little boys tends to get messy quite easily. If left unattended, you little boy’s face could be covered completely! This style is alright for little boys, but boys in their puberty stage could get acne from all the sweat and grime on their face. As such, it’s not very recommended for slightly older boys! Doesn’t this haircut style just scream “Oh, so cool!” to you? Little boys adorned with an awesome fashion sense will definitely benefit from this hairdo. Trim or shave off just one side to create this cool boy look! You can leave the other longer side combed straight downwards or perm it to your liking as well. Active little boys with long hair might not want their sight obscured by their hair all the time. However, perhaps they still like having long hair! For this scenario, simply tie their hair up in a tiny bun on top. It creates a win-win scenario where the little boy can have long hair and also have it away from his face. Plus, man buns are stylish. It should definitely be one of the little boy long hairstyles too! If your little boy’s hair is thinner and softer in texture, you can go for a look like this. You can fluff up your little boy’s hair so that it doesn’t appear too dampened. Achieve this soft and gentle look with a hairdryer, a comb and nothing else! Don’t want to take up too much time for hair maintenance? This little boys long hairstyle will need no care at all! You can come the fringe upwards, or you can leave it swept in behind your ears. Whatever the case, your hair will still look all natural and fancy. Not all of us are blessed with big, loose curls. However, judging from the pictures above, you can tell that thin, tighter curls still look just as fabulous! These little boys’ long and curly hairstyles only add on to their cuteness. Who wouldn’t want to have curly hair like this? This hairstyle for little boys with long hair is considered to be shorter as compared to others on this list. As the heading shows, the pictures above depict bangs with front fringes – also called bangs. This length is quite a refreshing change from the usual long cuts or super short styles for little boys. 25. Dreadlocks – So Dense! If you are blessed with a thick head of hair, you can definitely get this dreadlock style done. Unlike most other people, you might find that you can still keep a dense head of hair appearance. It just looks like an upgraded, better hairstyle for little boys with long hair as compared to normal straight ones, doesn’t it? And there you have it! We have compiled a total of 25 little boys long hairstyles in this list. If you like any of these styles, be sure to bookmark this page! You can keep your little boy’s hair long for a while first. Then, you can head to the hairdresser and request for a hairstyle like any of the photos here. Support us by sharing our posts on your social media too!